Who Plays Older Judith On 'The Walking Dead'? 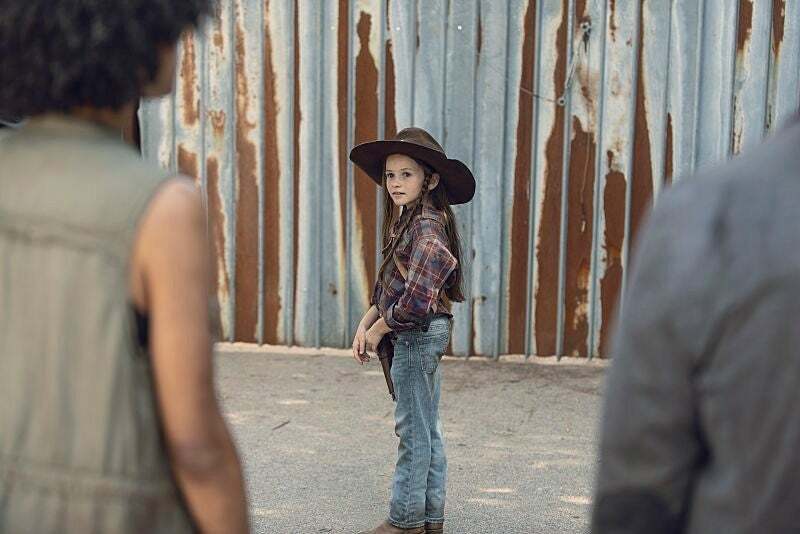 The Walking Dead has officially cast Judith on The Walking Dead with 11-year-old Cailey Fleming playing the part. The AMC series introduced the older version of Judith at the end of Episode 9x05, following Rick's disappearance from the show. Six years after Rick flew away from Alexandria at the hands of Jadis, Judith rescued a new group of survivors in a location nearby. Fleming joined the series in Episode 9x05 and will play a large role moving forward, beginning with Sunday's Episode 9x06. "Cailey is unbelievable," The Walking Dead executive producer and director of Episode 9x05 Greg Nicotero said on ComicBook.com's After the Dead show. "Listen, I mean we wanted to be able to tell the audience that a tremendous amount of time has passed, so we kept the camera locked off in that field and then you just see the barn sort of collapse and all the trees grow, and then, you know, we designed that all of a sudden you just felt like you were in a whole different story. And then there was all these people that you didn't recognize and they were fighting for their lives and they're screaming, and then she shows up and provides the cover and then she says, 'Judith. Judith Grimes.' And picks up the hat." Fleming is so talented, Nicotero is quite blown away by the young actress. "The first time I shot with her she was so good I didn't have any notes for her," Nicotero said. "She's like 10 years old! She's like four foot tall, like the gun is bigger than she is! When she has to lift that gun, the gun weighs more than she does." If Fleming looks familiar, it might be because she previously played Young Rey in Star Wars: The Force Awakens during a flashback sequence which took place on Jakku. "It was really sweet because she just walked in and did it and I walked over and I said, "I feel like I should give you a note, but you did such a great job that I don't,'" Nicotero said. "I didn't have anything to say, she did an awesome job. She's phenomenal."